Sharon Abreu in The Climate Monologues. Photo by Michael Hurwitz. BOTTOM LINE: Sharon Abreu’s one-woman show shares the stories of climate-based trauma facing people all over the globe. For those familiar with the work of Anna Deavere Smith, Sharon Abreu puts forth a similar style of interview-based monologues in which she portrays the voices of climate activists around the world. Sharon interviewed eight men and women in order to share their stories; by changing simple costume pieces—like a bandana or a floral vest—she plays subjects ranging from a college student to a Navy Pilot to a Master Carver of the Lummi Nation. Some monologues are poignant, concerning rising water levels or a sick granddaughter attending elementary school next to a coal mine. Others are factual and verging on optimistic, like when speaking about solar energy’s cost-effectiveness and ability to withstand hurricanes. What is special about Abreu’s one-woman show is not the subject matter; we have all learned countless facts and statistics about the environment and the human race’s grave impact upon nature. We all know that we are a wasteful species, and the damage done holds ominous consequences. What many people in the audience don't know are the stories. Abreu’s monologues bring a humanity to the statistics that plaster our newspapers and Facebook feeds. She doesn’t just give you the facts, she gives you a human life, bent and reshaped by environmental abuse. The Climate Monologues, however, is not a call to arms. The project is a call for mindfulness. We, as country, often know so little about what’s happening in our own back yard—what is happening to our water? Who is planning another destructive pipeline? It is, indeed, time for people to start really scrutinizing their daily impact on this earth we all share, and—if Sharon Abreu is involved—maybe write a song about it too. 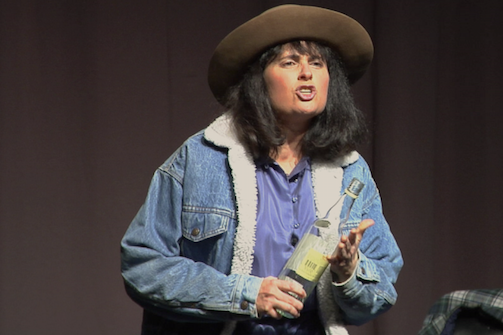 The Climate Monologues is written and performed by Sharon Abreu and directed by Paula Russel. Photography by Michael Hurwitz. Produced by the United Solo Theatre Festival.